Happy day after the 4th of July. I am a little late in my day with the post because everyone who was off decided to write in with questions and it’s been a get caught up from all the people that also celebrated kinda day. I received a question on Saturday as I was on my way to the beach that jumped out of my mailbox flashing the words blog post on it. The question went something like this. If you’re the SEO lady, what do you care what I do with my social media? I think over the last 20 years, we have strayed away from a tenant of marketing 101. The website drifted out into its own space and got treated as a redheaded step child. That is no longer acceptable. And in 2016, all marketing efforts need to be well- coordinated and integrated. Google has demanded this to have ANY success ranking in their search engine. Let me say that again. Google basically requires an integrated marketing plan. Every one of these items i vitally important for a site to rank well. So why does the SEO lady care if the website closes deals; if the message is right; if the blog is pushed out through social channels; if the content is compelling and natural; if people click on your page? Because if these things are not done right and sending the right signals you do not have a ranking website. I have used this graphic for years to explain everything is necessary for good Search Engine Rankings Additionally, PPC is also dependent on appearance and conversion as well. Plus, having a good SEO presence helps shoppers at the top of the sales funnel to buy and use the PPC link for the brand they know and trust. Even traditional marketing in the form of TV, Print and Display ads support the overall health of the website and affect how well your website ranks. If all these things are not right the website will not rank. Now let me say upfront, I suppose in lieu of doing things right you can employ black hat techniques and be forever chasing an algorithm or being one crazy zoo update away from being out of business. And I know people who do this and SEO companies that act in this way as well. More times than not, I’m asked to go in and clean up their craziness. 1 Why SEO and Social Media are conjoined and inseparable? Why SEO and Social Media are conjoined and inseparable? The word Conjoined is not often used in marketing. It’s a great word to use here because it really paints the right picture. We’ve all seen conjoined twins and in many cases when separated one of the twins flourishes and the other twin lags behind or worse. And so it goes with SEO and Social Media since the beginning of 2016. Officially Google says that it is not dependent on the social networks for high ranking websites. But they don’t really put out statements on why things do or don’t rank, so take that with a grain of salt. But let’s look at this first Google is dependent on great content. And what happens when you have good content, people link to the great content. And how would people find the great content? If only there was a way to push that content out into the world. Now theoretically people will make links to great articles they find. And those links are a vote. So when you think about the social networks, why wouldn’t you want those folks to count. It’s an army of people validating a website. So every great piece of content that goes up has the potential to send links and/or signals back to the website. So the social networks basically are sending endorsements or votes to your websites. If you don’t hook up and do this properly, the site is missing these signals and is not really an option any longer. Next is tackling the need to build a large audience and become a social media influencer. Influencers definitely carry more weight. Influencers bring more traffic. More traffic is a signal to Google. And how does one become an influencer? Well, by writing great content of course. Now one thing it takes to be an influencer is followers and what most will tell people in the know, say you should post at least 10 times a day. Now that for the normal small business is just not possible nor is there that much to say for most of them. Additionally the mistake I think most people make is they post other people’s stuff. So this morning I was watching a video by Eric Enge. And theoretically I could of/should have shared that on twitter with my comment. But who gets that credit. Eric Enge, not me or ACTWD. So as I say 10 things a day, it really doesn’t help the small business owner to post 10 links to 10 other websites. But here’s what else you don’t want to do. Post silly stuff, just to post. I saw one guy years ago that would put up a spammy article on gondola shelves and then just go spam his social networks with them. So he and 3 of his friends would like the post and he would do this every day 30 times a day. This doesn’t help anything either. You need to post a well written useful graphic or article, video, slide presentation and share that with great hashtags and make people want to like you or make sure they hear what you say on a daily basis. And once you get enough posts, start repurposing and reposting. You then begin to influence how things happen, how people perceive an industry or in my case I’m always teaching how not to be taken advantage of or how to run a website, from the front end Marketing side to the under the hood web hosting side. Why Don’t Other People Have To Do This? I hear this a lot from customers, and then they point to someone that is much larger than they are. And 9 times out of 10, it’s not right or not effective. I had a friend recently show me something on Exxon’s site. And asked me about how they could do what ever it was. Exxon for starters has 3.7 million links point to them from over 16,000 unique websites. This makes them have a lot of lead way. I have a custom tour operator that wanted to know why he couldn’t make his site like The Knot. The knot has 13.7 million link point to it and 53,000 unique domains. So they have a completely different set of rules than a local tour operator in Houston Texas. I did promise his wife though when we got as big as The Knot I would be happy to do what they wanted. Bottom line is the smaller you are the more things you have to do right within Google’s mind to overcome these large sites. And even for me, I’m not a huge fish compared to a GoDaddy or Network Solutions. I have to work to get every link I can. Sure some of my customer link to us to say we run their sites, and that’s helpful. But when they are little guys with no power I often think their well meaning may hurt us. But I have a long way to get 38 million sites linking to me with 800,000. So what does this all get me? So remember I said that Google says that social is not a ranking variable. Let me tell you an antidotal story. Three months ago I went to PubCon in Austin and I love Pubcon, because I often walk away saying yes I knew all this but it adds a perspective. Also often there are nuggets buried in the talks that a sharp minded pro will identify and run with it. When I came back home to Houston, I decided I was going to put full efforts into getting this blog running right and see what impact it had on the ranking of this website. Mind you this is a really old domain that I’ve taken care of it though the years. In fact I let it sit for about 10 years with just one-page links for our customers. So there was pretty well no traffic. Since I’ve put this blog on the site and am writing it myself with my personality, quirky as it may be, we are now on the first page for some very coveted terms locally as well as some other terms nationally. The content on this blog and the social twitter interactions are driving this site. No doubt in my mind. I’ve gained only 4 links and none of them have been great ones. But I’ve gained followers, and people are interacting and voting on my posts and with all that going on my SERPs just keep rising. So as with conjoined twins, website owners need to understand that separating SEO and Social will damage one side of the equation. And honestly, I think that if you were to separate Social and SEO, Social can be well developed and do well. 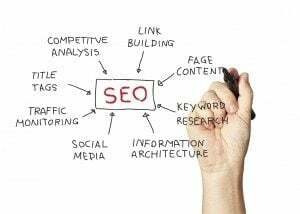 SEO the job is far harder because you’re missing a huge component. Sites end up missing the link building that is needed and you begin missing the signals that allows google to know what your site is about. If you’re Exxon it doesn’t matter but if you’re a Business trying to go national, it’s simply something you should not be missing if you intend to do with driving traffic to your website. Beth Guide, owner of ACTWD, is a leader in SEO and Digital Marketing. She also is a well known public speaker and technology expert within Houston. ACTWD is a leading Digital Marketing and IT Services company.